Idaho Archives - Red Truck Fly Fishing Co. The South Fork of the Snake River is in southeastern Idaho close to the Wyoming border. The South Fork begins as it flows out of 20 mile long Palisades Reservoir in the community of Swan Valley, forming a 64-mile stretch of legendary tail-water fly-fishing. The South Fork is also a beautiful river for flat water rafting, canoeing and kayaking. If you float this river in a canoe know what you are doing as it is big water and its flat-water appearance can fool you to its dangers. Bald eagles and Ospreys are prevalent and many nest high above on treetops along the riverbanks, it is always a treat to see one swoop down and catch an unsuspecting fish. The South Fork Snake River has been called Idaho’s most unique riparian ecosystem containing the largest continuous cottonwood ecosystem in the state. The South Fork provides habitat for nine nesting bald eagle pairs and up to 100 wintering eagles. The U.S. Fish and Wildlife Service considers this river section to be the most important fish and wildlife habitat in the state of Idaho. Moose are seen regularly in the river bottom. The South Fork of the Snake boasts 4,000 fish per mile, which makes it one of the most productive rivers in the country. The quality of fishing on the South Fork has improved dramatically since a slot limit was introduced. All fish between 8 and 16 inches (the prime breeders) must be released and you are only allowed to keep two fish that aren’t rainbows. The South Fork also is an all-wild trout fishery as they quit planting it years ago. 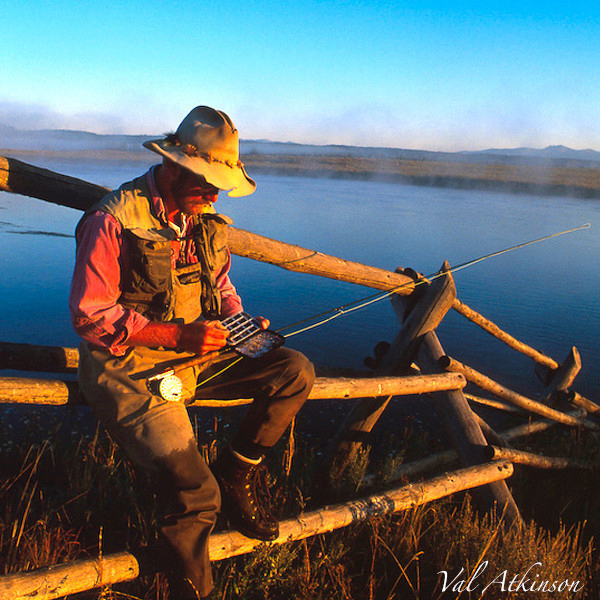 It is said that it is the best wild-trout fishery in the lower 48 states. Wild native cutthroat trout are a mixture of both fine-spotted and Yellowstone races. Fine-spotted cutthroat are stocked as sub-catchables and catchables into Palisades Reservoir and some are flushed into the South Fork with reservoir drawdowns. Although exotic wild rainbow, hybrid, and brown trout provide a significant component of the catch throughout the South Fork drainage, they pose a potential threat to the genetic integrity and long-term viability of wild cutthroat populations. Stocking in the mainstem and tributaries was discontinued in the early 1980s. The majority of anglers practice the catch-and-release ethic, because of this and the slot limit the river has maintained a healthy population of breeding fish. The river is primarily a cutthroat fishery; however, it is also possible to get into a fair number of browns and rainbows. In recent years we have seen a dramatic increase of the rainbow population and the Idaho Game and Fish is encouraging fisherman to kill all rainbow caught. As much as I prefer to catch a brown or rainbow because of their better fighting ability I would also like to maintain a healthy Cutthroat population because they are more likely to be caught on a dry fly than Rainbows and Browns. The key to fishing the banks of this river while floating is getting your fly as tight to the bank as possible and allowing it to drift just inches form the bank in most spots. When fishing from a gravel bar its possible to hook and land a dozen or more. This is one reason why the South Fork has gained a reputation as one of the country’s greatest trout fisheries. After spring runoff and the start of potato irrigation there is very limited access for wade fishing due to high river flows so a float trip is recommended from June till September. A drift boat allows access to many of the productive gravel bars and side channels that are inaccessible on foot. There are also many miles of the South Fork inaccessible from roads. The first 12 miles (section one) begins at the Palisades Dam and ends at the Connant boat ramp. This is the most accessible and as a result, the most crowded. Despite the crowds, some of the larger fish tend to be caught and released on this upper section of the river. This section of river provides outstanding views of the rugged mountains on either side of the river and hosts one of the most picturesque small waterfalls anywhere. The downside is some are calling this section “the parade of homes” for the growing number of trophy homes springing up along it’s banks. The 24-mile stretch below Connant boat ramp is considered the “Canyon,” the Canyon is divided into two sections called the middle and lower (or section two and section three). Section two ends at Cottonwood Boat Ramp. There are many National Forest campgrounds along the riverbanks. Camping is a great way to enjoy the river and break up the long canyon section. Both section one and two make for exceptional one-day fishing trips. The canyon is spectacular, with walls towering hundreds of feet straight up from the river and dotted with pine trees. The canyon gives the impression of a wilderness trip although you are floating right below cultivated barley and wheat fields you can’t see. It is common for an experienced angler to boat 30 fish a day with the average fish ranging from 16 to 18 inches. Access to section three is through Ririe ID; you drive up a dirt road on the north side of the river to Cottonwood boat ramp and start you float there. There are several places to fish along the road if you don’t have a boat. Section four starts at Byington Boat Ramp in Ririe and goes to where it joins up with the Henry’s Fork of the Snake by Manan ID. The river here changes character as it is no longer in the mountains, it is flatter, more braided and winds through private farmland but is an awesome fishery none the less, many big browns can be found here. Most boaters take out at the Lorenzo river access off of highway 20 between Idaho falls and Rexburg ID but the lightly fished section below Lorenzo can be very productive and there is a takeout right below where the South Fork merges with the Henry’s Fork. For the best dry fly action the river is best fished from July through mid August. The first half of July is the height of the prolific stone fly hatches, which brings just about all of the fish to the surface to gorge themselves on one of the largest dry flies, the largest of the Stone Flies the Salmon Fly is sometimes 3 inches in length. By the first week of August the fish are a bit more reluctant to bite as most have been caught and released several times by then. When the fish continue to refuse dry flies, emerger and cripple patterns are highly effective, especially “when the fish are feeding in the riffles and back channels. The warm summer days of August bring out one of the trouts favorite foods, the grasshopper. When the fish are keying in on hoppers and are becoming weary of hopper patterns, try twitching a rubber legged hopper pattern. The twitching motion of those rubber legs can entice a wary fish into a strike. Educated trout can sometimes be fooled with a dropper fly. A dropper is a nymph, emerger or attached to a buoyant and visible fly attached with an 18 inches of 4X or 5X tippet to bend of the hook. Hoppers, Turck’s Tarantula and the Double Humpys are excellent flies to set up with a dropper. The large high floating dry works well to spot the takes on the small drys, nymphs and emergers. October brings in a season of extremes, the fishing can be the best but the weather can be the worst. For those willing to take the gamble and come in October the rewards can be tremendous. The cooler weather of fall bring on the Blue Wing Olive hatches and many of the fishermen have left for the year and gone hunting and the trout lose their weariness of flies that they acquire during the heavy fishing pressure of summer. These hatches last well into the winter. This time of year the browns are moving to their spawning beds and there are increased chances of catching big browns. The Idaho State record brown was set at 26.6 pounds and was taken on the South Fork. Monster browns in the 15-pound class are taken every year. Fall is also a better time of the year for the wade fisherman as the lower water flows of fall open up many places to wade that are inaccessible during higher water. The Henry’s Fork of the Snake River, located in eastern Idaho, is one of the most famous trout streams in all of the United States. It’s legendary hatches and abundant large wild rainbow trout make the Henry’s Fork one of America’s top fly-fishing destinations. The river flows for approximately 150 miles and within its journey passes some of the more classic dry fly water in the United States. Gentle flowing meadowland, pocket water, and spring creek like sections make up much of this legendary fishery made popular by Avril Harriman the railroad man. 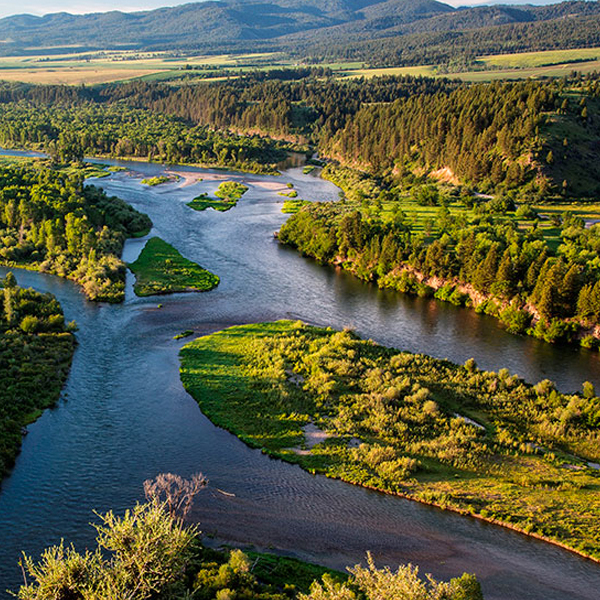 The Henry’s Fork of the Snake is a spectacular river and fishery. Anglers come from all over the world to this river to fish its diverse and productive waters. Henry’s Lake is the source of the Henry’s Fork River. The lake is fed by seven creeks, and by springs in the lake bottom. It is very rich water for trout, loaded with weeds and insects. Henry’s lake is an awesome fishery in its own right and has produced many state records. The river flowing from the outlet dam is just as rich as the lake. It winds across the grassy, often wildflower-covered meadows of Henry’s Lake Flat. This is a section of quiet runs and deep pools with often marshy or boggy banks and many spring-fed tributary creeks. The fish do not have many holding spots due to an almost featureless bottom, and tend to gather in the deeper holes. This is a six-mile meandering meadow section flanked on three sides by mountain ranges in excess of 10,000 feet. The fish run large, seldom less than two pounds. One must seek concealment or kneel while casting and keep low until the fish are hooked. The first half of this section from Henry’s Lake to where Big Springs flows into the river is a good stretch of water that is less visited than much of the water below Island Park Reservoir. Above the confluence of Big Springs and on to the lake outlet is an all-wild trout fishery and receives no hatchery fish. This section is the least fished of any part of the river. For the angler who hates crowds Henry’s Lake Flat is the place. Below the Flats you can expect about two miles of dense willow swamp before the river meets the 480 million-gallon daily flow of 52-degree water from Big Springs. From Big Springs down to the U.S. Highway 191 bridge at Mack’s Inn the Henry’ s Fork is a deep swamp-marsh stream of very large pools with a mostly silt-covered bottom. There is gravel underneath the silt, and it shows in some places, but in others the silt is deep enough to be problematic. This is however a cold and productive stretch of the Henry’s Fork. Below Island Park Reservoir begins the one of the most popular stretches of Henry’s Fork River. A mile below the tail-water outflow of the reservoir the Buffalo River flows into the Henry’s Fork. The junction of these two rivers is the start of Box Canyon, which is famous for its large rainbows that inhabit this section of tumbling water. The fishing here is especially good for anglers looking for an “easier” place to fish. This section is roughly 3 miles long and can be entered most easily by the road turning into Island Park Reservoir just north of Pond’s Lodge, then turning off just short of the dam down to the boat launching spot about a half-mile downstream from the dam. Below Box Canyon the Henry’s Fork slows down and widens once it emerges from its narrows on its way through the community of Last Chance. Here the Henry’s Fork looks more like a giant spring creek than a river. This seven-mile stretch through Last Chance and Harriman State Park is not only home to an abundance of large wild rainbows but also acclaimed for its prolific hatches. The flat meadow water of the Harriman State Park encompasses some of the best dry fly fishing anywhere. These college-educated rainbows can be very selective and unpredictable and have humbled many of the world’s finest anglers. This meandering meadow water extends for about 9 miles, starting at Last Chance below the mouth of Box Canyon and extending downstream to the summer home community of Pinehaven. The Henry’s Fork below Osborne Bridge lies about three miles of water; there are some nice glides, a few riffles then the smooth water stretch approaching Pinehaven. The half or three-quarters of a mile of water just above and below Pinehaven is a truly great stretch of water with almost as many hatches as the Harriman State Park but respect the private property. Below the park the Henry’s Fork flows for a few more miles before reaching Riverside Campground. After passing Riverside Campground the river enters Cardiac Canyon. This canyon provides tremendous pocket water fishing for nearly 8 miles before reaching Upper and Lower Mesa Falls. If you float this section know what you are doing. From the Riverside Campground downstream to the confluence of Warm River, the Henry’s Fork drops about 1000 feet in elevation. This includes about 15 miles of water. Most of this area is inaccessible and requires some hiking into a steep canyon. The water is very similar to the Box Canyon and you fish it much the same way. After the Henry’s Fork cascades over Mesa Falls it slows down its pace The river flows for several miles before reaching the confluence of the Warm River. Brown trout and a small population of Yellowstone Cutthroats join the population of rainbows below Mesa Falls. Much of this stretch is accessible from a road that runs along the north bank of the river. Below Warm River the Henry’s Fork takes on a different look with more defined pools, runs and riffles. After joining the Warm River the Henry’s Fork flows for several more miles before reaching Ashton Reservoir. The access is very good and most of the water is wadable. This section of Henry’s Fork has a large population of trout, but since it isn’t under the protection of special regulations many of the fish run small, there are some big ones however so always be ready. This section is also an easy float. The section of the Henry’s Fork below Chester Reservoir is a good section of river but has more limited access. Some quality fish are found throughout this stretch of river. Access to Henry’s Fork River can be found along Route 20, Route 47, and other side roads along the river. There are several areas to fish along the river that are clearly marked.